Agus River is a river that flows for 36.5 kilometres (22.7 mi) from Lanao Lake to Iligan Bay, Philippines. It cuts through the provinces of Lanao del Sur and Lanao del Norte. Settlements along the banks of the river include the City of Marawi, the Municipality of Linamon and the City of Iligan. It separates into two channels as it drains to Iligan Bay; one going over the Maria Cristina Falls while the other supplies the Tinago Falls. The river descends for about 2,200 feet (670 m) from its source as it flows for 21 miles (34 km) before draining to the sea. The river is relatively shallow as it is only 4 feet (1.2 m) deep in some areas. The Agus River's watershed spans about 11,320.00 hectares. In 1992, the National Power Corporation financed the reforestation of the Lake Lanao-Agus River watershed, planting over 1500 hectares of Acacia mangium, Durio zibethinus and other indigenous trees. It has a discharge of about 10 cubic metres per second (350 cu ft/s) and flows from a narrow depression off the northwestern rim of the lake and flows over a basalt rock formation. The canyon carved by the river suggests a short erosional period. The lake and the river are used for both commercial and sport fishing, as well as for recreational activities such as boating and swimming. The river in its entirety, however, is not navigable because the current in some areas reaches a velocity of up to thirty miles an hour. The NAPOCOR's hydroelectric project on the Agus River generates 70% of the electricity used in Mindanao due to the hydroelectric plants in the river and Maria Cristina Falls. However, the hydroelectric plants and the requisite regulatory dams have changed the fluctuations of the water level of Lake Lanao, affecting the indigenous people, producing conflicts with the local population. In Maranao mythology, Lake Lanao once threatened to drown the people of Sebangan with its ever-rising waters. The Archangel Gabriel is thought to have made the Agus river in order to drain the lake. ^ Prof. Geoffrey G. Salgado. "Official Website of the Iligan City Government - Growth of an Industrial City". Iligan City Government. Archived from the original on 12 April 2008. Retrieved 2008-03-29. ^ a b The Haribon Foundation for the Conservation of Natural Resources. 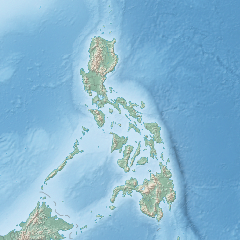 "Philippines" (PDF). International Water Management Institute. pp. 69–70. Archived from the original (PDF) on 2010-07-17. Retrieved 2008-03-29. ^ U.S. Coast and Geodetic Survey (1921). United States Coast Pilot, Philippine Islands... Govt. print. off. p. 134. ^ "Watershed Areas". Department of Environment and Natural Resources (Philippines). 2006. Archived from the original on 11 April 2008. Retrieved 2008-03-29. ^ Mero, D.C. "Financing community-based watershed reforestation in the Philippines" (PDF). Retrieved 2008-03-29. ^ Pendleton, Robert L. (April 1942). "Land Utilization and Agriculture of Mindanao, Philippine Islands". Geographical Review. 32 (2): 180–210. doi:10.2307/210270. JSTOR 210270. ^ Philippines Bureau of Science. Monograph. p. 207. ^ Ehrlich, Paul R.; Richard W. Holm; Peter H. Raven (1969). Papers on Evolution. Little, Brown. ^ Nieva, Gregorio (1921). The Philippine review (Revista filipina): (Revista Filipino); a Monthly ... Gregorio Nieva. p. 102. ^ Concepciòn, Sylvia; Larry Digal; Rufa Guiam; Romulo de la Rosa; Mara Stankovitch (December 2003). "Breaking the links between economics and conflict in Mindanao" (PDF). International Alert. Archived from the original (PDF) on 2008-05-13. Retrieved 2008-03-29. ^ "How the Angels Built Lake Lanao". SEAsite: Center for Southeast Asian Studies Northern Illinois University. Retrieved 2008-03-29. Wikimedia Commons has media related to Agus River.